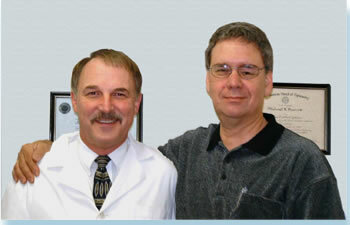 Mike Barrett is an ocularist who has worked many times in conjunction with Dr. Garrity. Mike informed us that Dr. Garrity is one of only a handful of physicians in the world to perform the lid-saving eye exenterations. Mike Barrett used an alginate material to take an impression of Tom's eye socket. He used the impression to construct a wax model, which he hand-sculpted to match Tom's remaining eye. The wax model was then used to make a prosthesis, which was constructed of polymethyl methacrylate. This custom ocular prosthesis was then hand painted to match Tom's right eye. Mike is, by training, also an artist, and he achieved an almost perfect match. Tom's upper eyelid needed time to adjust to the prosthesis, and Tom made a second trip two months later to have a clear ptosis crutch constructed on the ocular prosthesis that would prop up the eyelid. Because Tom no longer has eye muscles, the eye will not move. However, with advances in technology this may someday be an option.